Received: July 1, 2015; Revised: September 18, 2015; Accepted: September 24, 2015; Published online: March 1, 2016. Statins, HMG-CoA reductase inhibitors, are known to cause serious muscle injuries (e.g. myopathy, myositis and rhabdomyolysis), and these adverse effects can be rescued by co-administration of coenzyme Q10 (CoQ10) with statins. The goal of the current research is to assess the efficacy of combined treatment of CoQ10 with Atorvastatin for hyperlipidemia induced by high-fat diet in SD rats. 4-week-old Sprague-Dawley male rats were fed normal diet or high-fat diet for 6 weeks. Then, rats were treated with either Statin or Statin with various dosages of CoQ10 (30, 90 or 270 mg/kg/day, p.o.) for another 6 weeks. Compared to Statin only-treatment, CoQ10 supplementation significantly reduced creatine kinase and aspartate aminotransferase levels in serum which are markers for myopathy. Moreover, CoQ10 supplementation with Statin further reduced total fat, triglycerides, total cholesterol, and low-density lipoprotein-cholesterol. In contrast, the levels of high-density lipoprotein-cholesterol and CoQ10 were increased in the CoQ10 co-treated group. These results indicate that CoQ10 treatment not only reduces the side effects of Statin, but also has an anti-obesity effect. Therefore an intake of supplementary CoQ10 is helpful for solving problem of obese metabolism, so the multiple prescription of CoQ10 makes us think a possibility that can be solved in being contiguous to the obesity problem, a sort of disease of the obese metabolism. Statins are widely used for the treatment of hypercholesterolemia and for the prevention of cardiovascular diseases. These drugs inhibit the enzyme HMG-CoA reductase, which plays a central role in the production of cholesterol in the liver (Alberts et al., 1980; Stancu and Sima, 2001). Reduction of intracellular cholesterol induces the activation of sterol regulatory element binding proteins (SREBPs) which activate the gene expression of low-density lipoprotein (LDL) receptor, resulting in the reduction of circulating LDL (Sehayek et al., 1994; Stancu and Sima, 2001). Statins are the most efficient drugs for reducing plasma cholesterol level, and generally well-tolerated (Golomb and Evans, 2008). The most common adverse effects of statins are liver and muscle damage including elevated liver enzyme levels in serum, myopathy, myositis and rhabdomyolysis (Manoukian et al., 1990; Nakahara et al., 1998; Delbosc et al., 2002). As a result of a common biosynthesis pathway, both cholesterol and Coenzyme Q10 (CoQ10) biosynthesis are decreased by statin treatment (Diebold et al., 1994; Nakahara et al., 1998; Satoh and Ichihara, 2000; Berthold et al., 2006). CoQ10 (also known as Ubiquinone) is a water insoluble component of virtually all cell membranes, and has multiple metabolic functions (Quinzii et al., 2007). It is a key component of the mitochondrial electron transport system (Crane, 2001; Littarru and Langsjoen, 2007). Therefore, CoQ10 deficiency resulting from statin treatment may impair cellular energy metabolism, and contribute to the development of myopathy and muscle symptoms, as described in patients treated with statins (Franc et al., 2003; Thompson et al., 2003; Zita et al., 2003). In the clinical study by Thibault (Thibault et al., 1996), CoQ10 supplementation significantly reduced the severity of statin-induced myopathy. Later, Kim et al. reported that the elevated serum creatine kinase levels in two lovastatin-treated patients with mild myalgia and muscle weakness were completely reversed by CoQ10 supplementation (Kim et al., 2001). Most recently, a clinical study with thirty-two patients (15 women, 7 men) treated for hyperlipidemia with statin showed that CoQ10 supplementation may decrease myopathic symptoms caused by statin treatment (Caso et al., 2007). In the present study, we investigated the effect of CoQ10 supplementation on the adverse effect induced by Atorvastatin (Statin) treatment in Sprague-Dawley (SD) rat. As an indicator for muscle damage, aspartate aminotransferase (AST), alanin aminotransferase (ALT) and creatine kinase levels in serums were monitored (Vanholder et al., 2000; Huerta-Alardin et al., 2005; Bosch et al., 2009). Histological analysis was performed to examine the effect of CoQ10 on rhabdomyolysis. In addition, to test the effect of CoQ10 on hyperlipidemia, total cholesterol (TC), triglyceride (TG), high-density lipoprotein-cholesterol (HDL-C) and low-density lipoprotein-cholesterol (LDL-C) levels in serums were measured after 6 weeks of Satin and/or CoQ10 treatment in obese rats. 4-week-old male SD rats (Koatech, Pyeongtaek, Korea) were housed in a temperature (23 ± 3°C) and humidity (55 ± 15%) controlled room with a ratio of 12-hour light/12-hour darkness, and were fed normal diet (Jongang Lab Animal, Seoul, Korea) for 1 week. Then, the animals were separately fed two kinds of diets, the normal diet and the high-fat diet for 6 weeks. The compositions of the normal diet and the high-fat diet which modified the AIN-76 dietary composition (Reeves et al., 1993), are shown in Supplemental Table 1. After 6 week diet, the animals were subdivided into eight groups (Supplemental Table 2); normal diet group (N), normal diet with Statin and CoQ10 (270 mg/kg) group (NSC270), high-fat diet group (H), high-fat diet with Statin group (HS), high-fat diet with CoQ10 (270 mg/kg) group (HC), and high-fat diet with Statin and CoQ10 at various doses (30, 90 or 270 mg/kg) group (HSC30, HSC90, HSC270). Coenzyme Q10 (CoQ10) and Statin (Atorvastatin calcium) were kindly provided by Daewoong Pharmaceutical Co., Ltd. (Seoul, Korea). Rats were administered with Statin and/or CoQ10 orally once a day for 6 weeks. Body weights and food efficiency ratio (FER) were monitored twice a week. FER was determined as follows: FER=weight gain per day (g/day)/food intake per day (g/day). At the end of the treatment, rats were anesthetized with CO2 gas. The epididymal, abdominal, visceral fat-pads, livers and hearts were surgically removed, weighed, snap-frozen in liquid nitrogen, and stored at ?70°C until use. This study was approved by the Institutional Animal Care and Use Committee of Kyung Hee University, Seoul, Korea. Blood samples were collected from the hepatic portal vein using vacutainer (Becton Dickinson&Co. Franklin Lakes, USA). Serums were separated by centrifugation at 3,000 × rpm for 15 min at 4°C. TC, HDL-C, LDL-C, TG, creatine kinase, ALT, and AST levels in serums were determined enzymatically using commercial kits (Asan Diagnostics, Seoul, Korea). Serum proteins were precipitated with ethanol. The liquid phases were extracted three times with n-hexane and the organic phases were pooled and evaporated. The extract was reconstituted with 15:85 dichloromethane-methanol mixtures and analyzed by high-performance liquid chromatography (HPLC). Total concentrations were determined by the area under the curve of external standard at 270 nm. The heart tissues were fixed in 10% formalin and embedded in paraffin wax. Frozen heart sections from fixed tissues were cut in 10 μm thick and mounted on the slide glasses. To detect lipids, the sections were immersed in propylene glycol for 5 min and stained with Oil red O (Sigma, St. Louis, MO, USA) for 7 min. After rinsing with 85% propylene glycol and water, tissue samples were counterstained with Mayer’s haematoxylin for microscopic examination. Statistical analysis was performed by One-Way ANOVA (SPSS version 13.0; SPSS, Inc., Chicago, USA). Differences between groups were considered statistically significant at p< 0.05. Data are presented as mean ± S.E. values. The high-fat diet group (H) showed significantly higher body weights and FER than the normal diet group (N). Statins-treated high-fat diet group (HS) showed a similar increase of body weight as the high-fat diet group (H). However, the body weight of the CoQ10 (270 mg/kg) treated group (HSC270) was significantly lower compared to that of the non-treated group (HS) (Supplemental Table 3). Total fat was dramatically increased by high-fat diet (N: 12.81 ± 1.07, H: 21.22 ± 1.58 g) and this increase was slightly attenuated by Statin treatment (HS: 20.20 ± 0.78 g) (Fig. 1). Interestingly, CoQ10 treatment also reduced the increase of total fat induced by high-fat diet (HC: 20.48 ± 0.76 g), and the combined treatment of Statin and CoQ10 significantly lowered total fat weight (HSC270: 17.14 ± 1.02 g). 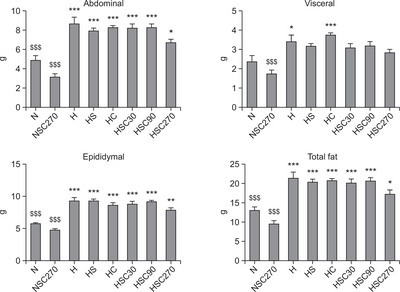 In addition, the abdominal and epididymal fat weights in the HSC270 group were also significantly reduced by CoQ10 supplementation (Fig. 1). The influence of CoQ10 administration on liver and heart weight in Statin-treated rats were investigated (Table 1). Compared to the normal diet group (N: 9.58 ± 0.22 g), the high-fat diet group (H: 11.00 ± 0.56 g) showed significant increase of liver weight (p<0.01), suggesting high-fat diet-induced obesity in rats as expected. The liver weight of the Statin-treated group in high-fat diet (HS) was marginally lower than that of the non-treated group (H). In contrast, compared to the high-fat diet group (H), CoQ10 treatment in the high-fat diet group (HC) showed significant decrease of liver weight (9.62 ± 0.11 g, p<0.01). In addition, co-administration of CoQ10 with Statin in the high-fat diet group (HSC) decreased liver weight in a dose-dependent manner. Heart weight of the normal diet group (N: 1.32 ± 0.02 g) was significantly lower than that of the high-fat diet group (H: 1.51 ± 0.02 g). Either Statin or CoQ10 treatment lowered the increase of heart weight induced by the high-fat diet (p<0.01). When the rats were treated with both Statin and 270 mg/kg CoQ10 (HSC270: 1.34 ± 0.03 g), the heart weights were decreased to as low as the normal diet group (N: 1.32 ± 0.02 g). To test the effect of CoQ10 supplementation on myopathy, myolysis or rhabdomyolysis induced by Statin treatment, histological analysis of heart tissues from each group was performed. We failed to observe any significant pathological findings in the high-fat diet group (H) as well as the normal diet group (N). However, in Statin-treated high-fat diet group (HS), we observed mild non-inflammatory cellular changes including nuclei concentration and formation of vacuole in some cases (Fig. 2). Further microscopic examination is required to determine the effect of CoQ10. Along with the increase of creatine kinase levels, significantly elevated level of AST often suggests the existence of liver or heart disease such as hepatitis, congestive heart failure, bile duct problems or myopathy (Giboney, 2005). We observed a significant increase of AST level in Statin-treated group (HS, 157.30 ± 9.34 U/L) compared to the non-treated group (H, 98.10 ± 4.23 U/L, p<0.001), suggesting that Statin treatment induced muscle injuries in the high-fat diet group. However, CoQ10 (270 mg/kg) treatment significantly decreased serum AST level (Fig. 3). Serum ALT levels were also elevated by Statin treatment from 51.40 ± 2.04 U/L to 92.80 ± 10.86 U/L. Concurrent administration of CoQ10 with Statin (HSC) showed slightly increased ALT levels at 30 and 90 mg/kg dosages, however, we observed decrease of ALT levels in the 270 mg/kg CoQ10-treated group (Fig. 3). It has been reported that CoQ10 depletion during statin therapy might be associated with subclonal cardiomypathy, and that this situation is reversed upon CoQ10 treatment (Thompson et al., 2003; Littarru and Langsjoen, 2007; Marcoff and Thompson, 2007). Musculoskeletal side effects of statins include elevations in creatine kinase, myopathy, dermatomyositis and rhabdomyolysis. Other musculoskeletal side effects reported with HMG-CoA reductase inhibitors have included arthralgia, myalgia, tendon rupture, and dermatomyositis (Silva et al., 2006; Golomb and Evans, 2008). To test the effect of CoQ10 supplementation on the Statin-induced muscle injuries, we measured serum creatine kinase levels as well as ubiquinone levels (Table 2). Since the amount of CoQ10 in the high-fat diet group was already below the detection limit (H, <20 mg/ml), we were not able to observe further depletion of CoQ10 after Statin treatment (HS, <20 mg/ml). However, CoQ10 treatment dramatically increased the serum CoQ10 levels in the high-fat diet group (HC). Administration of CoQ10 with Statin also significantly increased the levels of serum CoQ10 in a dose-dependent manner (HSC30, 90 and 270). Notably, administration of Statin in CoQ10-treated obese rats dramatically attenuated CoQ10 level (HC vs HSC270), confirming the CoQ10-depleting effect of Statin as previously reported. A high-fat diet increased serum creatine kinase level from 400.10 ± 43.57 U/L (N) to 554.60 ± 31.51 U/L (H). Statin-treated rats showed further increase of creatine kinase level in serum (HS: 652.40 ± 36.40 U/L). Concurrent administration of CoQ10 with Statin (HSC) decreased serum creatine kinase levels in a dose-dependent manner, suggesting that Statin-induced muscle injury in the high-fat diet group was attenuated by the combined treatment of CoQ10 (Table 2). To explore the effect of CoQ10 on lipid level in blood, we examined TC, TG, HDL-C and LDL-C, of each group after 6 week treatment (Fig. 4). 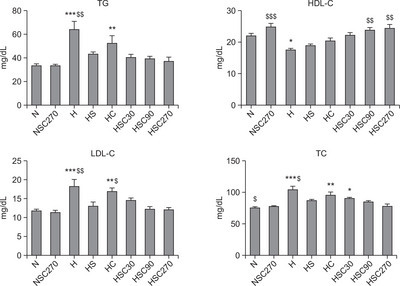 Rats in the high-fat diet group (H) exhibited significantly higher TC, TG, LDL-C. As expected, the high-fat diet resulted in a decrease of HDL-C level in serum (N group vs H group, p<0.05). The increases of TC, TG and LDLC levels by a high-fat diet were significantly reduced by Statin treatment. Concurrent treatment of CoQ10 with Statin (HSC 90 and HSC270) further decreased TC, TG and LDL-C levels in a dose-dependent manner and significantly increased HDL-C levels, suggesting that CoQ10 supplementation enhances the anti-hyperlipidemic effect of Statin. Since their introduction to the market in 1987, statins have been used to treat various lipid disorders, such as hypercholesterolemia, hypertriglyceridemia, mixed dyslipidemia and homozygous familial hyperlipidemia (Anand, 2003; Niska and Han, 2009; Ray et al., 2010). Statins inhibit HMG-CoA reductase which converts HMG-CoA into mevalonic acid, a cholesterol precursor. When they bind to the active site of HMG-CoA reductase, statins induce conformational change of the enzyme, resulting in the blocking of its interaction with its natural substrate, HMG-CoA (Istvan and Deisenhofer, 2001). Although statins are known to be well tolerated, long-term treatment of statins can produce a variety of adverse effects including the elevation of serum creatine kinase level, myopathy, myositis, myalgia, low incidence of rhabdomyolysis, and initiative or accelerated progression of cataracts and neoplasia (Buchholz et al., 2000). In contrast to their molecular mechanism in the treatment of hyperlipidemia through inhibition of HMG-CoA reductase, little is known about the mechanism by which statins produce muscle injuries. Recently, several possible mechanisms have been proposed: 1) reduction of the cholesterol content of skeletal muscle membrane, and 2) inhibition of farnesyl pyrophosphate, which is an intermediate for the production of ubiquinone (Coenzyme Q10) (Thompson et al., 2003). CoQ10 has been found to be a key component in mitochondrial function (Deichmann et al., 2010). Localized in the inner mitochondrial membrane, it facilitates electron transfer in the generation of adenosine triphosphate (ATP) (Siciliano et al., 2007). It has also been shown that CoQ10 has anti-oxidant effect, preventing the oxidation of proteins, DNA, and lipids (Giboney, 2005). Here, we demonstrated that CoQ10 supplementation can prevent the adverse effects of statins. 6 weeks of a high-fat diet induced obesity in SD rats. Serum lipid levels in the high-fat diet group exhibited increased creatine kinase (Table 2), as well as significantly higher TG, TC and LDL-C levels (Fig. 4). In a previous study, healthy volunteers treated with Simvastatin for 4 weeks have shown a 30% decrease of blood CoQ10 level (Laaksonen et al., 1995; Rundek et al., 2004). However, our study did not confirm a change of serum CoQ10 levels in Statin-treated rats due to low detection sensitivity (Table 2). Despite this limitation, our findings show that administration of Statin in CoQ10-treated obese rats dramatically attenuated CoQ10 level, confirming the CoQ10-depleting effect of Statin as previously reported, and raise the possibility that CoQ10 supplementation rescues the muscle injuries caused by Statin treatment. Co-administration of CoQ10 with Statin decreased body weight and liver weight in a dose-dependent manner in the high-fat (Supplemental Table 3) diet induced obese rats (Table 1). In addition, concurrent administration of Statin with CoQ10 (HSC) significantly decreased serum creatine kinase levels in a dose-dependent manner (Table 2). We also observed that CoQ10 treatment significantly decreased serum AST levels elevated by Statin (Fig. 3). The solubility of CoQ10 in water is extremely low, resulting in a poor oral bioavailability. It accounts for that the highest dose of CoQ10 improved biochemical parameters in our experiment. It is noteworthy that treatment with CoQ10 also provided a significantly enhanced potency of Statin in serum lipid profiles. The increases of TC, TG and LDL-cholesterol by a high-fat diet were significantly reduced by Statin treatment as expected. Moreover, the combined treatment of Statin with CoQ10 (HSC90 and HSC270) further decreased TC, TG and LDL-C levels and significantly increased HDL-C levels (Fig. 4). These results are consistent with previous report that CoQ10 supplementation inhibits the peroxidation of LDL-C which may play a key role in its anti-atherogenic effects (Littarru and Tiano, 2007). Therefore, it clearly appears that CoQ10 supplementation is beneficial in Statin treatment. Moreover, the possibility of a synergistic effect of Statins with CoQ10 supplementation should be further evaluated for clinical purposes. This research was supported by the Daewoong Pharmaceutical Co., LTD (06-ME-439N). The funders had no role in the study design, data collection or analysis, the decision to publish or preparation of the manuscript. Fig. 1. Effect of CoQ10 supplementation on adipose tissue weight in Statin-treated obese rats. Data are mean ± S.E. (N=10). *p<0.05, **p<0.01, ***p<0.001 vs. normal diet group, $$$p<0.001 vs. high-fat diet with Statin group. N: normal diet group, NSC270: normal diet with Statin and CoQ10 (270 mg/kg) group, H: high-fat diet group, HS: high-fat diet with Statin group, HC: high-fat diet with CoQ10 (270 mg/kg) group, and HSC30, HSC90, HSC270: high-fat diet with Statin and CoQ10 at various doses (30, 90 or 270 mg/kg) group. Fig. 2. Histological examination of heart tissues in the high-fat diet rats treated with Statin. Light microscopic finding/myocardium. In longitudinal (A) and transverse section (B), cardiac muscle fibers joined to each other by intercalated discs and having central nuclei and regular striations. 400×. Fig. 3. Effect of CoQ10 supplementation on serum ALT and AST levels in Statin-treated obese rats. Data are mean ± S.E. (N=10). AST: aspartate aminotransferase, ALT: alanin aminotransferase. **p<0.01, ***p<0.001 vs. normal diet group, $$p<0.01, $$$p<0.001 vs. high-fat diet with Statin group. N: normal diet group, NSC270: normal diet with Statin and CoQ10 (270 mg/kg) group, H: high-fat diet group, HS: high-fat diet with Statin group, HC: high-fat diet with CoQ10 (270 mg/kg) group, and HSC30, HSC90, HSC270: high-fat diet with Statin and CoQ10 at various doses (30, 90 or 270 mg/kg) group. Fig. 4. Effect of CoQ10 supplementation on serum TG, HDL-C, LDL-C and TC levels in Statin-treated obese rats. Data are mean ± S.E. (N=10). TG: Triglyceride, HDL-C: High-density lipoprotein-cholesterol, LDL-C: Low-density lipoprotein-cholesterol, TC: Total cholesterol. *p<0.05, **p<0.01, ***p<0.001 vs. normal diet group, $p<0.05, $$p<0.01, $$$p<0.001 vs. high-fat diet with Statin group. N: normal diet group, NSC270: normal diet with Statin and CoQ10 (270 mg/kg) group, H: high-fat diet group, HS: high-fat diet with Statin group, HC: high-fat diet with CoQ10 (270 mg/kg) group, and HSC30, HSC90, HSC270: high-fat diet with Statin and CoQ10 at various doses (30, 90 or 270 mg/kg) group. Values are means ± S.E. (n=10). p<0.001 vs. high-fat diet with Statin group. N: normal diet group, NSC270: normal diet with Statin and CoQ10 (270 mg/kg) group, H: high-fat diet group, HS: high-fat diet with Statin group, HC: high-fat diet with CoQ10 (270 mg/kg) group, and HSC30, HSC90, HSC270: high-fat diet with Statin and CoQ10 at various doses (30, 90 or 270 mg/kg) group. p<0.01 vs. high-fat diet with Statin group. N: normal diet group, NSC270: normal diet with Statin and CoQ10 (270 mg/kg) group, H: high-fat diet group, HS: high-fat diet with Statin group, HC: high-fat diet with CoQ10 (270 mg/kg) group, and HSC30, HSC90, HSC270: high-fat diet with Statin and CoQ10 at various doses (30, 90 or 270 mg/kg) group. Alberts, AW, Chen, J, Kuron, G, Hunt, V, Huff, J, Hoffman, C, Rothrock, J, Lopez, M, Joshua, H, Harris, E, Patchett, A, Monaghan, R, Currie, S, Stapley, E, Albers-Schonberg, G, Hensens, O, Hirshfield, J, Hoogsteen, K, Liesch, J, and Springer, J (1980). Mevinolin: a highly potent competitive inhibitor of hydroxymethylglutaryl-coenzyme A reductase and a cholesterol-lowering agent. Proc Natl Acad Sci USA. 77, 3957-3961. Anand, SS (2003). Quantifying effect of statins on low density lipoprotein cholesterol, ischaemic heart disease, and stroke: systematic review and meta-analysis. Law MR, Wald NJ, Rudnicka AR. BMJ 2003; 326: 1407?408. Vasc. Med. 8, 289-290. Berthold, HK, Naini, A, Di Mauro, S, Hallikainen, M, Gylling, H, Krone, W, and Gouni-Berthold, I (2006). Effect of ezetimibe and/or simvastatin on coenzyme Q10 levels in plasma: a randomised trial. Drug Saf. 29, 703-712. Bosch, X, Poch, E, and Grau, JM (2009). Rhabdomyolysis and acute kidney injury. N Engl J Med. 361, 62-72. Buchholz, U, Mouzin, E, Dickey, R, Moolenaar, R, Sass, N, and Mascola, L (2000). Haff disease: from the Baltic Sea to the U.S. shore. Emerg Infect Dis. 6, 192-195. Caso, G, Kelly, P, McNurlan, MA, and Lawson, WE (2007). Effect of coenzyme q10 on myopathic symptoms in patients treated with statins. Am J Cardiol. 99, 1409-1412. Crane, FL (2001). Biochemical functions of coenzyme Q10. J Am Coll Nutr. 20, 591-598. Deichmann, R, Lavie, C, and Andrews, S (2010). Coenzyme q10 and statin-induced mitochondrial dysfunction. Ochsner J. 10, 16-21. Delbosc, S, Cristol, JP, Descomps, B, Mimran, A, and Jover, B (2002). Simvastatin prevents angiotensin II-induced cardiac alteration and oxidative stress. Hypertension. 40, 142-147. Diebold, BA, Bhagavan, NV, and Guillory, RJ (1994). Influences of lovastatin administration on the respiratory burst of leukocytes and the phosphorylation potential of mitochondria in guinea pigs. Biochim. Biophys Acta. 1200, 100-108. Franc, S, Dejager, S, Bruckert, E, Chauvenet, M, Giral, P, and Turpin, G (2003). A comprehensive description of muscle symptoms associated with lipid-lowering drugs. Cardiovasc. Drugs Ther. 17, 459-465. Giboney, PT (2005). Mildly elevated liver transaminase levels in the asymptomatic patient. Am. Fam. Physician. 71, 1105-1110. Golomb, BA, and Evans, MA (2008). Statin adverse effects : a review of the literature and evidence for a mitochondrial mechanism. Am. J. Cardiovasc. Drugs. 8, 373-418. Huerta-Alardin, AL, Varon, J, and Marik, PE (2005). Bench-to-bedside review: Rhabdomyolysis -- an overview for clinicians. Crit. Care. 9, 158-169. Istvan, ES, and Deisenhofer, J (2001). Structural mechanism for statin inhibition of HMG-CoA reductase. Science. 292, 1160-1164. Kim, WS, Kim, MM, Choi, HJ, Yoon, SS, Lee, MH, Park, K, Park, CH, and Kang, WK (2001). Phase II study of high-dose lovastatin in patients with advanced gastric adenocarcinoma. Invest. New Drugs. 19, 81-83. Laaksonen, R, Jokelainen, K, Sahi, T, Tikkanen, MJ, and Himberg, JJ (1995). Decreases in serum ubiquinone concentrations do not result in reduced levels in muscle tissue during short-term simvastatin treatment in humans. Clin Pharmacol Ther. 57, 62-66. Littarru, GP, and Langsjoen, P (2007). Coenzyme Q10 and statins: biochemical and clinical implications. Mitochondrion. 7, S168-S174. Littarru, GP, and Tiano, L (2007). Bioenergetic and antioxidant properties of coenzyme Q10: recent developments. Mol Biotechnol. 37, 31-37. Manoukian, AA, Bhagavan, NV, Hayashi, T, Nestor, TA, Rios, C, and Scottolini, AG (1990). Rhabdomyolysis secondary to lovastatin therapy. Clin Chem. 36, 2145-2147. Marcoff, L, and Thompson, PD (2007). The role of coenzyme Q10 in statin-associated myopathy: a systematic review. J Am Coll Cardiol. 49, 2231-2237. Nakahara, K, Kuriyama, M, Sonoda, Y, Yoshidome, H, Nakagawa, H, Fujiyama, J, Higuchi, I, and Osame, M (1998). Myopathy induced by HMG-CoA reductase inhibitors in rabbits: a pathological, electrophysiological, and biochemical study. Toxicol Appl Pharmacol. 152, 99-106. Niska, R, and Han, B (2009). Statins for secondary cardiovascular disease prevention for older primary care patients. J Natl Med Assoc. 101, 705-710. Quinzii, CM, DiMauro, S, and Hirano, M (2007). Human coenzyme Q10 deficiency. Neurochem Res. 32, 723-727. Ray, KK, Seshasai, SR, Erqou, S, Sever, P, Jukema, JW, Ford, I, and Sattar, N (2010). Statins and all-cause mortality in high-risk primary prevention: a meta-analysis of 11 randomized controlled trials involving 65,229 participants. Arch Intern Med. 170, 1024-1031. Reeves, PG, Nielsen, FH, and Fahey, GC (1993). AIN-93 purified diets for laboratory rodents: final report of the American Institute of Nutrition ad hoc writing committee on the reformulation of the AIN-76A rodent diet. J Nutr. 123, 1939-1951. Rundek, T, Naini, A, Sacco, R, Coates, K, and DiMauro, S (2004). Atorvastatin decreases the coenzyme Q10 level in the blood of patients at risk for cardiovascular disease and stroke. Arch Neurol. 61, 889-892. Satoh, K, and Ichihara, K (2000). Lipophilic HMG-CoA reductase inhibitors increase myocardial stunning in dogs. J Cardiovasc Pharmacol. 35, 256-262. Sehayek, E, Butbul, E, Avner, R, Levkovitz, H, and Eisenberg, S (1994). Enhanced cellular metabolism of very low density lipoprotein by simvastatin. A novel mechanism of action of HMG-CoA reductase inhibitors. Eur J Clin Invest. 24, 173-178. Siciliano, G, Volpi, L, Piazza, S, Ricci, G, Mancuso, M, and Murri, L (2007). Functional diagnostics in mitochondrial diseases. Biosci Rep. 27, 53-67. Silva, MA, Swanson, AC, Gandhi, PJ, and Tataronis, GR (2006). Statin-related adverse events: a meta-analysis. Clin Ther. 28, 26-35. Stancu, C, and Sima, A (2001). Statins: mechanism of action and effects. J Cell Mol Med. 5, 378-387. Thibault, A, Samid, D, Tompkins, AC, Figg, WD, Cooper, MR, Hohl, RJ, Trepel, J, Liang, B, Patronas, N, Venzon, DJ, Reed, E, and Myers, CE (1996). Phase I study of lovastatin, an inhibitor of the mevalonate pathway, in patients with cancer. Clin Cancer Res. 2, 483-491. Thompson, PD, Clarkson, P, and Karas, RH (2003). Statin-associated myopathy. JAMA. 289, 1681-1690. Vanholder, R, Sever, MS, Erek, E, and Lameire, N (2000). Rhabdomyolysis. J Am Soc Nephrol. 11, 1553-1561. Zita, C, Overvad, K, Mortensen, SA, Sindberg, CD, Moesgaard, S, and Hunter, DA (2003). Serum coenzyme Q10 concentrations in healthy men supplemented with 30 mg or 100 mg coenzyme Q10 for two months in a randomised controlled study. Biofactors. 18, 185-193.